Please note that we do not have bike or wetsuit hire options at our France locations (only in Portugal). Details about each of the optional extras can be found on our ‘Holiday Specifics’ page. These are all subject to availability. 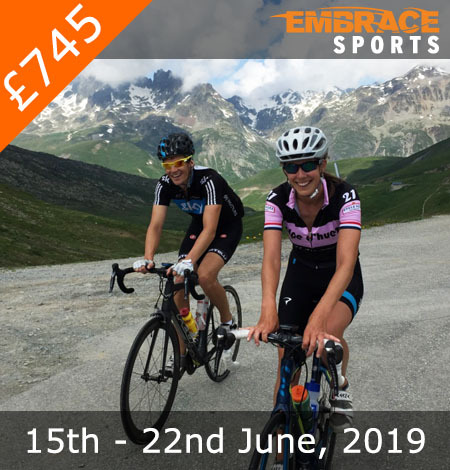 Reserve your place on this June Alps Triathlon Holiday in the French Alps. The French Alps is by far one of the most beautiful, breath taking and rewarding places a triathlete could base themselves for a training week. Embrace Sports has every possible detail covered to allow you to get the most out of your training week in the Alps. Find out why the pro’s base themselves here and join a group of like-minded triathletes on this fun-filled week. My 4th Embrace holiday and I have to say, the toughest yet. Fantastic accommodation in the chateau that feels really cozy. Great routes on the bike and the lake swims in two different locations were very scenic. Just enough rest time to make it a holiday but who comes on these trps to sunbathe anyway. Push us hard, that way we get far more satisfaction and a sense of achievement. Brilliant as always, cant wait to be back. A week to remember and for all the good reasons!! Great Coaches; Amazing Scenery; New Friendships; Delicious Food; Incredible Location; Superb Accommodation. 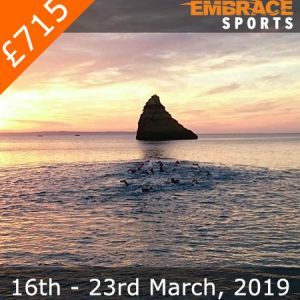 This is a week of intense and rewarding training that will pave your way into achieving your Ironman goal….and what better place to live the experience. Embrace provide it all……Bring on the next trip!! The embrace team go above and beyond to ensure you have a great trip! The coaching, food & people are all amazing! This was my 3rd time with Embrace and I absolutely loved this destination. You choose it for the climbs and they do not disappoint. But swimming and running was equally great. Very clean water, beautiful lakes. Accommodation 5*! Looking at all of the reviews they are all 5 stars that tells you all you need to know. Was my first time on the Alps Tri holiday having been to the Portugal camp many times. All the staff were excellent as always. All the participants were top athletes too with most being age groupers so plenty of experience all around. Everyone was super supportive. The cycling is a lot more challenging than Portugal so If this is your weak point then its a tough camp. Lake swimming was excellent and the endurance run was pleasantly flat. Brick running wasn’t lol. But what doesn’t kill you makes you stronger. Lovely countryside and views second to none. I’ve been to all of the Embrace locations and this one is truly amazing. The cycling was incredible, the coaches were brilliant (as usual) at catering for all abilities and the routes were pretty special- finishing on Alp D’Huez is definitely one of the highs! The swimming and running also didn’t disappoint; a vast crystal clear empty (of other people!) lake to swim in and pretty trails and loops to run around. Great coaching tips and support along the way. All the food throughout the week was delicious and never in short supply! 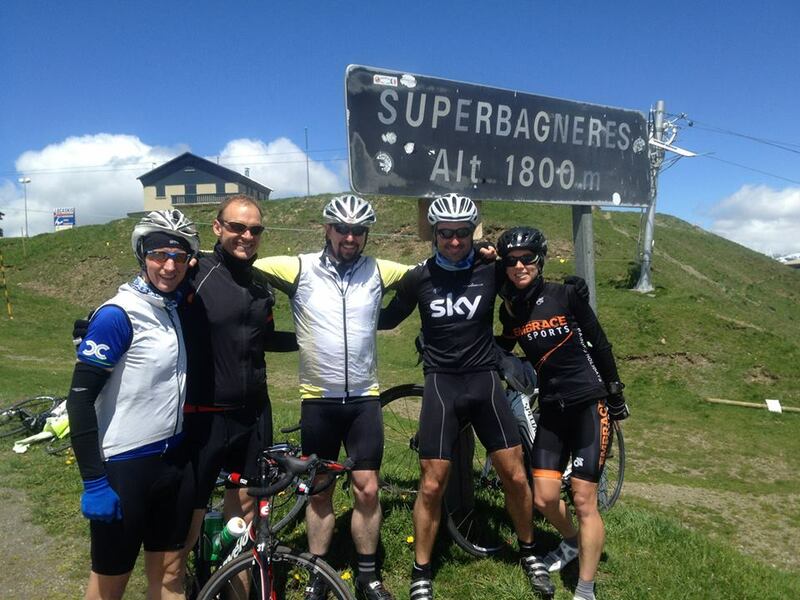 What a fantastic week of training on the Embrace Alps triathlon trip! I can’t wait to return. The cycling is amazing, conquering several mountains during the week, culminating in the long ride out and ascent of Alpe D’Huez. Totally brilliant. We were treated to beautiful lake swimming and scenic runs, fabulous food and great company. The coaches are an inspiring bunch, nothing is too much trouble and they are used to catering to all abilities, so this trip really is for everyone. This was a great camp for triathlon training! We had an excellent week of sunshine and perfect temps in an idyllic setting. The workouts were all manageable but challenging! We had just the correct mix of work and leisure. The staff was awesome. I can’t say enough good things about the week. I would highly recommend! Another great Embrace trip and my first in the Alps. The cycling, especially Alpe d’Huez, was the highlight for me, but the swimming and running sessions were also really enjoyable and in stunning (and quiet) locations. Coaching, food and atmosphere were all great, as always in my experience of Embrace trips. Superb chateau base, great Embrace coaching, superb food, fab company and just brilliant riding, running and open water swimming. Alp d’Huez was the highlight! My third trip having been to Portugal & the Pyrenees previous. Great holiday and training again. Graeme and the lads at Embrace looked after us Aussielads for 2 years that included 3 tours through the Pyrenees and the French Alps. We are a charity raising money for cancer research and the Embrace lads were very welcoming and really got into the spirit of what we were about and what we are trying to achieve. Besides the tour being amazing the food was simply outstanding and the stay in a local farm house was the icing on the cake. I would definiltey recommend Embrace to anyone looking for a first class organsisation to take the worry out of travelling to do a bike tour, leaving you with one thing only to concentrate on and that is what we love doing the most, riding our bikes! Thanks Embrace. You guys rock! My favourite training camp ( full stop ) with fantastic coaches who are a lot of fun, yet push you to reach your goal and also look after you. Had a great time every time I went and when the camp ends you just want to do it again and again.. its a great sense of achievements conquering French mountains in the Pyrenees day after day, just when you thought you cant, you learn that you can and loving every day of it. Also be prepared for fantastic variety of dinners. The only thing you have to worry about is not to overeat.. which always tends to happen. – but then again, those hills make you work hard and help you burn it off. 🙂 that what I told myself..
Go and enjoy it and get ready for a hell of a week of your life! After searching websites for the right week for me I came upon Embrace Sports and it didn’t let me down. An incredible week in the Pyrenees culminating in the ascent of the Tourmalet. The week changed the way I approached my training and I discovered the extent to which I could push my body. I managed to springboard from this week to a GB age group place and a European AG gold at the half distance. Can’t wait to get back out with the guys again. Thanks Neil, Graeme and Kat. Does exactly what it says on the tin; a great week of training with coaches who clearly know what they’re talking about and push everyone to achieve things they may not have thought possible. The accommodation is in a secluded place which allows everyone to train hard and recover hard. I was pleased to see that recovery beers after a hard days training weren’t frowned upon! Food is great – was disappointed to get home and have to plan all my own meals again. I’d definitely recommend to anyone doing a half or full Ironman & looking for a week away. My big dream is to acheive an Ironman! So… after years of doing sprint triathlons I decided it was time to up the game. 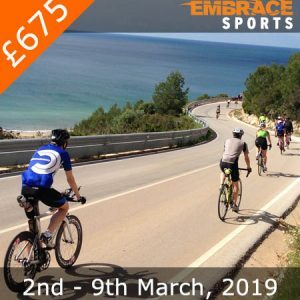 Being a big fan of the Algarve running camps, where better to get training and advice than with an Embrace Iron distance camp? I was totally nervous about this as I’m slow and where in running camp I can adapt I knew that bike rides could be more problematic. However, I had nothing to fear – the coaches were able to adapt training to all abilities and even to the weather. The setting was great, made for relaxing and socialising after training, and the food was amazing! I met some very inspiring people that week and after my 1st 1/2 Ironman this year I’ll definitely be back for another camp to train for the full. I recommend this camp for anyone wanting to train for a middle / iron distance – I learnt loads about biking, running and open water swimming ! Having now tried three different locations with Embrace, the Iron Distance holiday in the Alps did not disappoint! Fantastic coaching as always, great food and exciting routes all planned out for us. I was struck once again how the coaches manage to cater for all abilities, making sure everyone has a challenging and fun time. 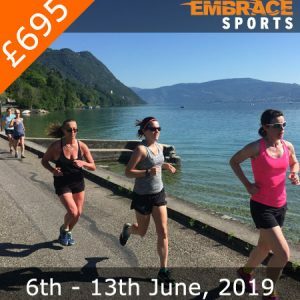 I would highly recommend an Embrace trip to anyone even vaguely interested in running or triathlon – they’re brilliant. This is my third year doing an embrace camp, and probably my favorite one to date. Having previously been on the Algarve triathlon camp twice, this was my first Iron distance camp. Luckily for me the camp is run with the same great organisation and enthusiasm and I enjoyed every minute of it. The cycling out here is amazing, access to fantastic swimming lake and great running all on the doorstep of a beautiful old french house. The only downside to the trip was some rain on a couple of days, but we countered this by lighting the fire inside and getting some quality recovery time in front of the fire. As always food was amazing and nutritious. I couldn’t recommend highly enough the week to anyone preparing for a long distance race or just looking to put in some training/socializing in beautiful surrounds. Many thanks to all the coaches ! This camp was exactly what I needed in the run up to my main event (IM Austria on 26 June). The combination of the three events was ideal, the standard of the fellow triathletes was excellent – pushed me hard enough – and the spirit of the camp was great, as ever with Embrace. This was my 5th Embrace holiday and I’ll definitely be back for more. Really enjoyed the week. Great to meet so many new faces as well as the familiar faces. The training is a good balance of training with still being able to chat and socialise. The coaches have other talents like cooking great food..